Even when people are hard at work, pictures of cookies, pizza and ice cream can distract them — and these junk food images are almost twice as distracting as health food pictures, concludes a new Johns Hopkins University study, which also found that after a few bites of candy, people found junk food no more interesting than kale. The study, which underscores people’s implicit bias for fatty, sugary foods, and confirms the old adage about why you shouldn’t grocery shop hungry, is newly published in the journal Psychonomic Bulletin and Review. First Egeth and lead author Corbin A. Cunningham, Distinguished Science of Learning Fellow in the Department of Psychological & Brain Sciences, created a complicated computer task where food was irrelevant and asked a group of participants to find the answers as quickly as possible. As the participants worked diligently, pictures flashed in the periphery of the screen — visible for only 125 milliseconds, which is too quick for people to fully realize what they just saw. The pictures were a mix of high-fat, high-calorie foods, healthy foods, or items that weren’t food. 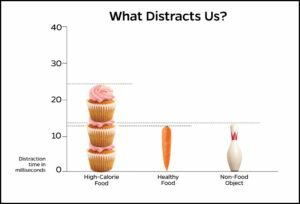 All of the pictures distracted people from the task, but Cunningham and Egeth found things like doughnuts, potato chips, cheese and candy were about twice as distracting. The healthy food pictures — things like carrots, apples and salads — were no more distracting to people than non-foods like bicycles, lava lamps and footballs. Next, the researchers recreated the experiment, but had a new group of participants eat two fun-sized candy bars before starting the computer work. The researchers were surprised to find that after eating the chocolate, people didn’t find the high-fat, high-calorie food images any more distracting than healthy foods or other pictures. The researchers wonder now if less chocolate or even other snacks would have the same effect. Cunningham said the results strikingly demonstrate that even when food is entirely irrelevant, and even when people think they’re working hard and concentrating, food has the power to sneak in and grab our attention — at least until we eat a little of it.